We posted a forex update about DAX30 on Monday as we were thinking about going long on this index since it was finding support at the 50 SMA on the H1 chart. The price did jump off that moving average but the jump was pretty weak and the price returned back down. 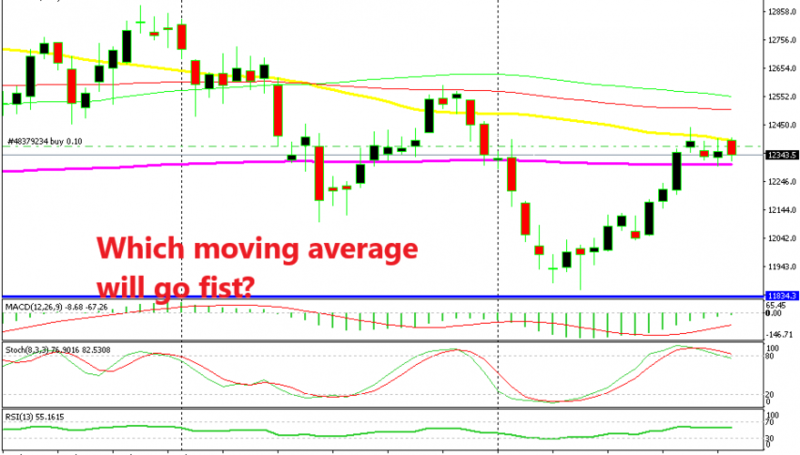 If we switch to the daily chart of DAX30, we can see that the 200 SMA (purple) was providing support. So, that is an encouraging sign for buyers. But, the 50 SMA (yellow) is standing at the top and it is ruining things for them. The 50 SMA has been capping the small bullish moves during the last few days, so that it the line in the sand for the buyers. If they can manage to push above it, then DAX will resume the bullish trend. If the 200 SMA (purple) gets broken on the downside, then the bears will be in control. The previous two daily candlesticks look bullish as they have formed two spinning bottoms above the 200 SMA. But today’s candlestick looks sort of bearish so for now it is a fight between buyers and sellers. If we are to buy DAX30, we will try to do so as close as possible to the 200 SMA so the risk/reward ratio is as good for us as possible. But, the FED meeting today is going to be very important and the market is in a wait-and-see mode, so we have to be patient.